The Waikiki sewer main that ruptured Friday was repaired yesterday afternoon, but not before sending more than 20 million gallons of raw sewage into the Ala Wai Canal, closing popular beaches and disrupting countless vacations. City officials said workers were able to shut off the flow of diverted sewage just after 1 p.m. But in Waikiki, tourists, surfers and other ocean users were still dealing with a disgusting mess after a switch in ocean currents. The mess of waste water, which had been heading out to sea, instead flowed back to some of the state's most popular beaches yesterday. Normally packed Waikiki beaches were mostly empty. Rainy weather kept many tourists away, and those on the beach were greeted by city signs that warned against swimming, boating and fishing, saying, "Sewage contaminated water. Exposure to water may cause illness." The city warnings about contaminated water were posted from Magic Island to Fort DeRussy, but the signs were no help to Japanese tourists who do not speak English. 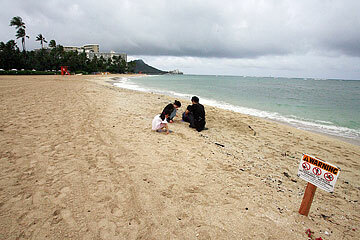 Japanese visitors were seen splashing around in the ocean at Duke Kahanamoku Beach despite signs there. One visitor said he thought the warning was about bad weather. Japanese-language signs were to be posted this morning, city spokesman Mark Matsunaga said. Signs warning of sewage-contaminated water near the Hilton Hawaiian Village and Hale Koa hotels. 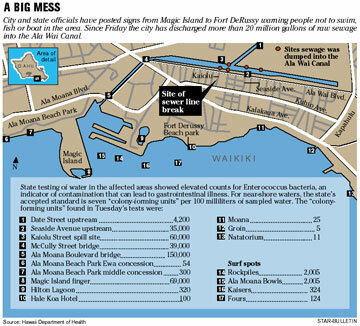 State Department of Health officials said water samples from the two nearby beaches showed elevated levels of bacteria. The city had posted warning signs at Magic Island's lagoon earlier in the week. Tourists who did get the message tried to salvage their Waikiki vacations even if it meant basking in the rain and swimming in their hotel pools. Newlyweds Matthew and Katherine Webster of Melbourne, Australia, said they probably will not swim in the ocean even once on their week-long Hawaiian honeymoon. They were walking along the beach next to the warning sign at Fort DeRussy park. "If it was sunny, it would be a major problem," Matthew Webster said. "It's a bit annoying." His wife said she was upset at not being able to go into the water, but Webster expressed understanding. "Where else is it going to go? I don't think there's anything they could've done," he said. At Kaiolu Street, where the 42-inch main ruptured Friday during heavy rains, city Director of Environmental Services Eric Takamura estimated last night that the diverted sewage was "over 20 million already." The temporary sewer line fix involved reinforcing the mended pipe with 30 cubic yards of high-strength concrete. Though temporary, it is expected to hold for several years until a permanent replacement pipe can be built, Takamura said. Design work on a permanent fix is almost complete, and bids for the $30 million job will be sought by the end of the year, he said. The project was included last year in the city budget. 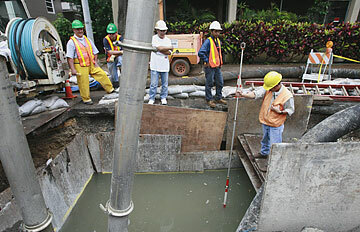 When a new 6,600-foot long pipe under Kaiolu, Ala Wai and Atkinson streets is completed -- hopefully in 2008 -- the city will rehab the pipe that failed Friday for use as a backup line, Takamura said. The lack of a backup line is what forced the city to pump sewage from all of Waikiki and parts of Makiki and Moiliili into the Ala Wai Canal this week, Takamura said. The only alternative would have been sewage backing up into Waikiki buildings, he said. Takamura said city workers would closely watch pressure indicators on the line through the night, to ensure there are no leaks. If all is well with the sewer line and the Board of Water Supply completes an unrelated fix of a water line in the trench, Kaiolu Street will be repaved today and open again tomorrow, he said. City and state officials agreed yesterday that the spill was the worst in Oahu history. 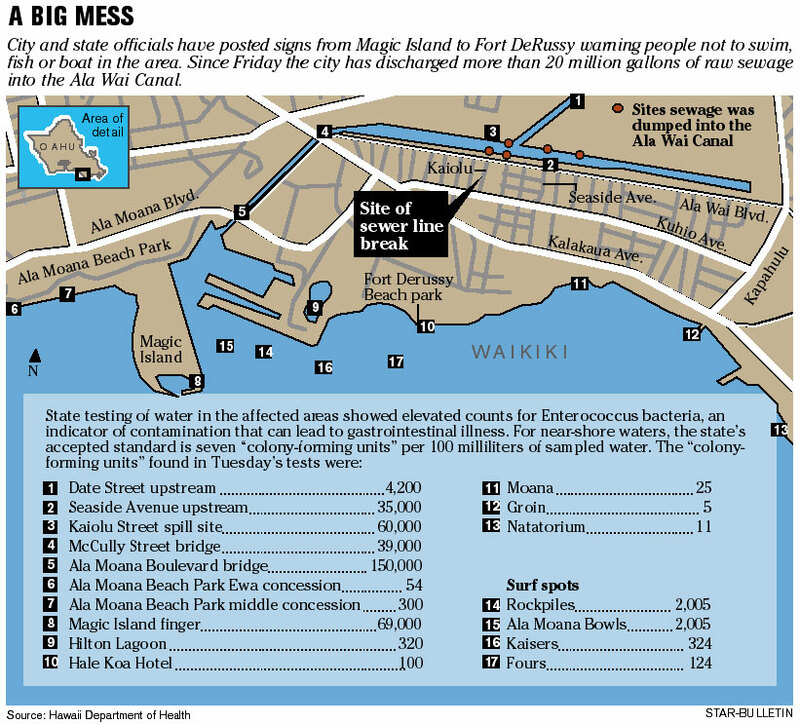 Before the current incident, the largest single spill had been a 2 million-gallon spill into Mamala Bay during a three-hour break on March 4, 2004, near the city's Sand Island Wastewater Treatment Plant. Ralph Goto, head of the city's lifeguard division, said Waikiki Beach has never been closed because of sewage in 25 years. The beach warning signs went up yesterday after results from water testing Monday showed that the current had changed, bringing some of the effluent back toward shore. Since Friday it had been heading out to the open ocean, so the city had posted only the banks of the Ala Wai Canal and areas surrounding the Ala Wai Boat Harbor. Using a bacterial measurement called colony-forming units, or CFUs, Hawaii has a stricter standard of cleanliness for swimming-water quality than the U.S. Environmental Protection Agency, said Watson Okubo, head of the state DOH's water monitoring division. Hawaii's threshold is 7 colony-forming units (CFUs) for the "indicator" enterococcus bacteria per water sample, compared with the EPA's standard of 35 CFUs, used on the mainland. Bacteria counts in samples taken Tuesday in Waikiki were far above either standard -- ranging from 60,000 CFUs at the Kaiolu Street spill site to more than 150,000 units at the Ala Moana Boulevard bridge into Ala Wai Harbor. On the beach in front of the Hale Koa and Hilton Hawaiian Village hotels, the level was 100 CFUs in Tuesday samples. But preliminary results from samples taken yesterday showed a spike in contamination at those beaches to 1,700 CFUs, Okubo said. Ala Moana Beach Park had levels from 54 to 300 CFUs in Tuesday samples. Enterococcus bacteria do not cause illness, but have been determined by the U.S. Environmental Protection Agency to indicate a likelihood that some people swimming in waters with that level of bacterial contamination will get a gastrointestinal illness, Okubo said. Robert Gabriel surveyed the ground-water elevation yesterday at the repaired sewer main on Kaiolu Street near the Ala Wai Canal. The main broke last Friday after heavy rains, forcing the city to pump raw sewage directly into the canal. The EPA estimates that water with 35 CFUs of enterococci would result in an estimated 19 swimmers per 1,000 becoming ill, Watson explained. Hawaii's 7-CFU standard would result in an estimated 10 swimmers per 1,000 getting sick from exposure. Marsha Wienert, Gov. Linda Lingle's liaison for tourism, said she learned of the elevated levels at 8 a.m. yesterday and personally contacted the management of the Hale Koa and Hilton Hawaiian Village hotels. Wienert said hotel staff alerted guests on the beaches of the water conditions even before the state posted signs. "Guests understand when you give them the facts, in regards to what happened," Wienert said. Wienert said that a planned public relations campaign to reassure potential visitors that Hawaii's rainy weather has ended will include information about the beach conditions returning to normal. 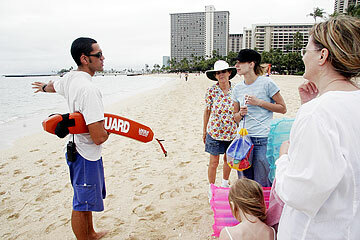 In Waikiki, some tourists ignored the warnings and enjoyed the ocean anyway. Kim Normington of San Jose, Calif., and his family spent the day taking surf lessons off Waikiki. He said the sewage spill did not really worry him. "We're just going to go take a warm shower," he said. Lizabeth Johnson and her husband are here from Illinois also for a convention. She said she was wary of the contaminated water. She spent the afternoon walking along the shoreline at Fort DeRussy Beach collecting twigs, seaweed and shells, which she intends to turn into art. "When I get them home, I'm going to put them in hand sanitizer," Johnson said, "and stick my whole body in bleach." Star-Bulletin reporter Nelson Daranciang and the Associated Press contributed to this report. The Honolulu Centennial Family Festival at Magic Island, which was slated to run today through Sunday, has been rescheduled for this Saturday and Sunday and April 7-9, city spokesman Bill Brennan said last night. Brennan said the change was "because of bad weather and more rain." He did not think it was related to the sewage problems. A public relations firm handling information about the celebration could not be reached for comment.